Today’s WOVEMBER WORDS post was written by one of our long term WOVEMBER supporters, Nadine Haarich, who writes about her own discovery of local wool. 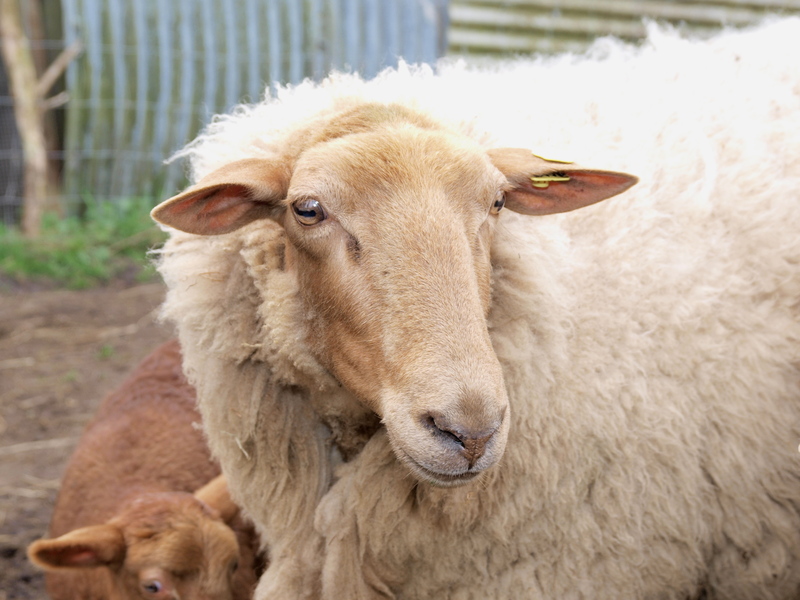 Nadine lives in Germany and was inspired to explore her local breeds for knitting her Shetland Wool Week Baa-ble hat. She has extended this adventure by swatching wool from breeds local to her. We love Nadine’s piece because it shows how folk all over the world can seek and celebrate local wool, and because it also shows how events like Shetland Wool Week – which celebrates the links between people, places and wool – can inspire every knitter to think more deeply about textiles and locality. Nadine’s piece is the very essence of what it means to KnitLocal! In September I made the journey to Shetland for the first time; my longest trip yet. Shetland wool and the knitting heritage of the islands naturally were the main focus of Wool Week and were very much on my mind. However, even before I began packing my suitcase, I found myself thinking about wool and knitting traditions closer to home. 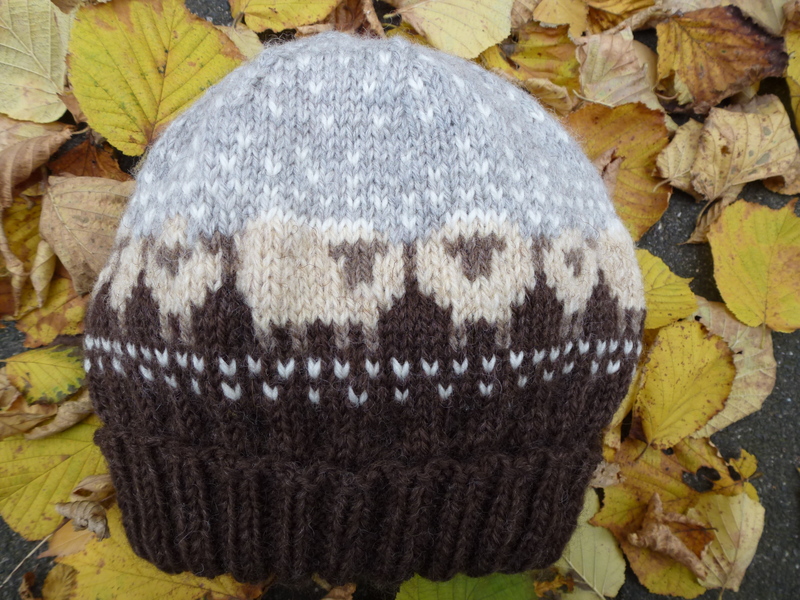 This year’s signature Wool Week hat – the Baa-ble Hat – uses the Shetland technique of Fair Isle knitting and was designed by Shetland Wool Week Patron Donna Smith. Naturally, I wanted to knit it in (you can guess) Shetland wool. The pattern was written for an Aran-weight yarn and unfortunately when I worked the hat as directed, it turned out too big for me. It slides down over my eyes so I can’t see very well while wearing it! What to do? With less than a week to go before I was leaving for Shetland I didn’t have time to adjust the pattern for fewer stitches so I decided to change the yarn weight. While looking through my stash my eyes fell on a hat I had made last year, entirely out of natural shades of Foula wool and I remembered that I had collected yarns from Germany in natural shades and from different breeds that were almost all in roughly DK weight. And so a second incarnation of the Baa-ble Hat was born. The chocolate brown brim, the grey of the sky and and the white of the snow are all knit out of merino yarn from a German yarn company in the south of Germany – Frankengarn – who source their wool from local farmers and sheep flocks. It’s a special merino yarn made by cross-breeding merino sheep with regional German breeds. It feels both soft and sturdy and has proved its longevity in a cowl that I’ve worn for the last three winters. I also love that the yarn comes in several natural shades and not only in white! By far my favourite yarn in this hat is the one I used for the sheep. It’s from a breed called Coburger Fuchsschaf – roughly translated as Coburg Foxsheep – and I got so excited when I discovered it that I wanted to know more! The Coburger Fuchsschaf was once a very popular and widely spread breed in Germany but became endangered even before the Second World War. It is native to the lower mountain ranges and quite hardy. Conservation efforts started in the early 20th century and today there are a small but growing number of flocks. Though several organisations are promoting the Fuchsschaf in German, it is still on the list of endangered breeds. In 2013 there were around 4,000 sheep flocks of varying sizes. Coburg Foxsheep are, like most German sheep breeds, not bred primarily for their wool but rather for more mixed uses such as landscape preservation and meat production. 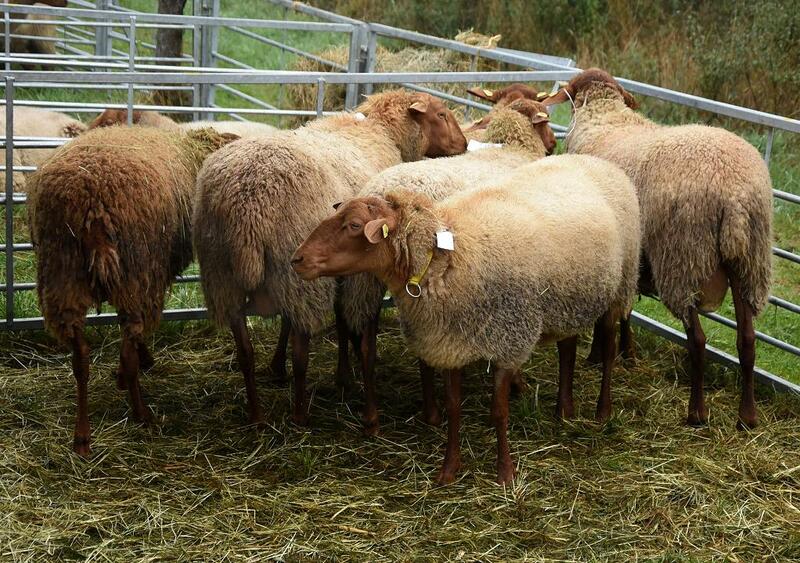 The fleece of the Foxsheep is special: The lambs are born with a reddish brown coat which gradually lightens to a warm cream shade and with 30 to 36 microns the fibre belongs in the medium range, comparable to that of the Welsh Mountain Sheep. The reddish hue stays in the form of longer hairs which lends the resulting yarn both a bit of a halo and a reddish / golden shading. Because of this the Coburg Foxsheep is celebrated for its “golden fleece“ – Goldenes Vlies in German. The wool is now mostly used by individual hand-spinners and other textile artists and crafters, but some smaller enterprises are making use of it for garments and home textiles and a few yarn shops sell natural or dyed shades of the yarn and fleece. My feet will be warmed by Foxsheep slippers this winter! When I heard about the single breed Breed Swatch-Along organized by Louise of the KnitBritish Podcast, it was a natural step for me to start working with the Foxsheep yarn. In turn, that then made me think about what it means to “Knit Local” and the sheep native to Germany. 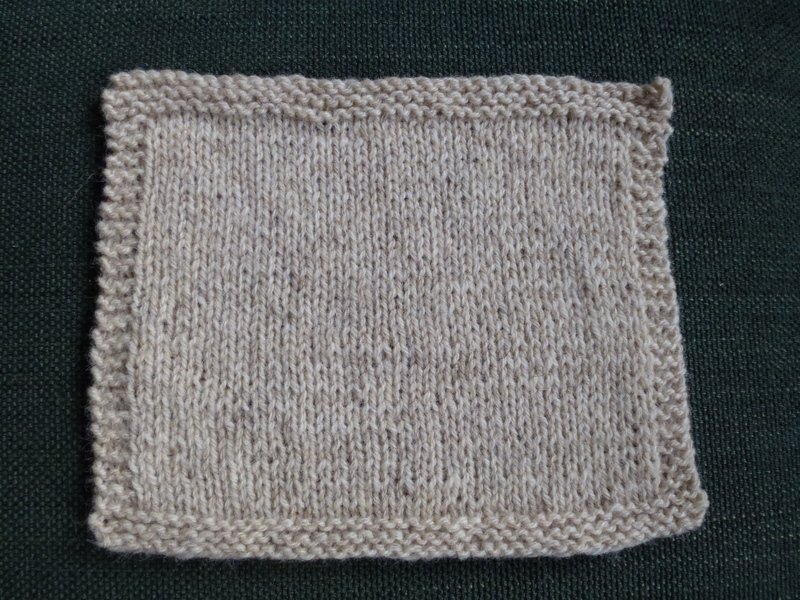 My swatch is made from the DK/sport weight yarn with which I knit the sheep in the Baa-ble hat. It came in a hank of 200m/100g. To my amateur spinner’s eye it looks like this is a worsted-spun yarn (short forward or backward draw) from a woollen preparation because while it bloomed a lot after the first wash the stitch definition is very good and the fabric feels light but dense. The drape in the swatch is very nice and I love how the wool instantly warms up in my hands, much like Shetland yarn does. There was very little pillage after a day pinned between my jeans and my shirt, which can be partially attributed to the 3ply construction of the yarn. 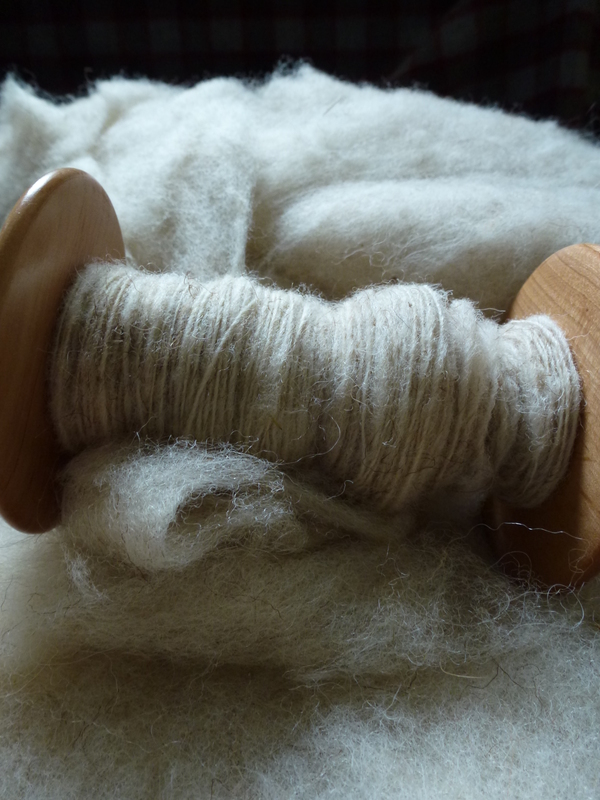 Apart from the yarn I had some carded fleece and I’ve spun a sample of it as a true woollen 2ply (long draw and woollen prep) and I might try to get my hands on a combed top (or make one myself) to get some perspective on a worsted-spun preparation. After soaking and fulling it slightly the yarn bloomed a lot and became very soft and lofty. I suspect most of the longer red hairs will fall out while knitting, making it even softer. 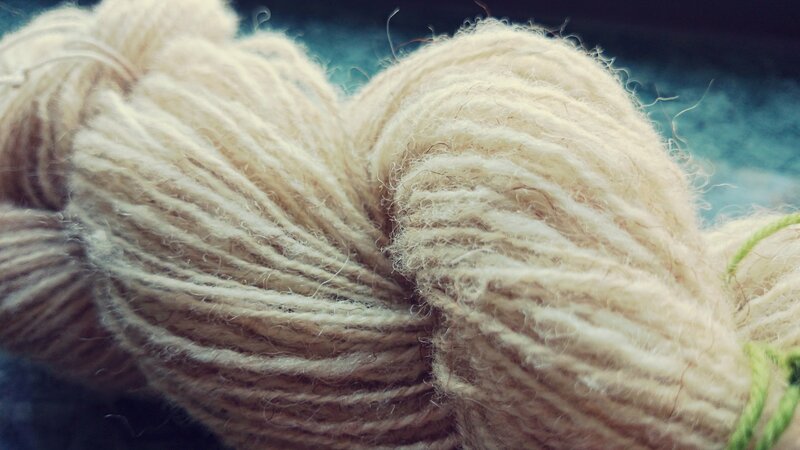 Depending on the way it is spun, the Foxsheep yarn could be suitable for a wide range of garments from socks and cardigans/sweaters and possibly even a shawl or a cowl made out of a woollen spun and slightly fulled yarn. So, a very versatile yarn with lots of potential! I’m glad that knitting the Baa-ble hat has made me take a closer look at this yarn and recall that box of local and regional wool in my stash. It also made me realize that while I know that I can knit very sturdy socks out of Southdown yarn, which won’t felt, and that Manx Loaghtan is soft enough to wear next to my skin, that I don’t really have a lot of knowledge about the wool from sheep breeds native to Germany, like the Coburg Foxsheep and lots of others. So this year’s Wovember I will make swatches out of single breed German yarns, spin samples out of the fleece I have, and try to find out what I can about the sheep breeds and wool production on – or at least not too far from – my doorstep. Images used with kind permission. Thank you so much for this lovely piece Nadine; HURRAH FOR THE COBURG FOXSHEEP and for KNITLOCAL!